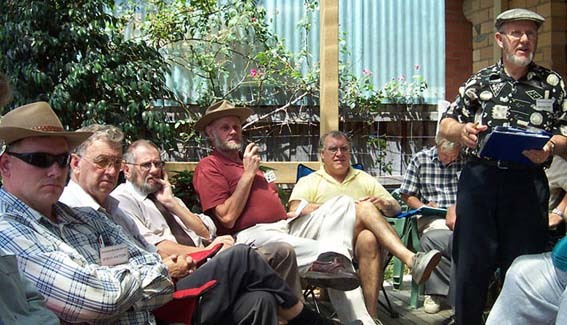 Our first meeting for 2003 was held at Carol and Jack Parsisson's on an idyllic summer's day. Excellent venue, first rate hospitality, good company, lots of Meccano - what more could anyone ask for? Many thanks to Carol and Jack for looking after us all so well. Informal proceedings began well before the advertised time of 1 pm with the usual crowds around the sales tables and general chit chat. At 2:10 pm our ever patient President Mike Maloney blew "time up" for the sales tables and summoned everyone onto Jack's rear deck for the more formal part of the meeting. Here he welcomed everyone to the meeting, thanked Carol and Jack for providing such a pleasant venue and invited our new members and visitors to introduce themselves. John Edgar's was the usual story - had Meccano in the 50s as a child and then put it away. But he did have the foresight to buy a No 10 set in 1971, just in case! John heard about us from radio publicity for our Exhibition last October and this inspired him to get out his Meccano from his childhood. Regrettably this is now rather dilapidated and John has been visiting Jack to supplement his collection with new Jackano. 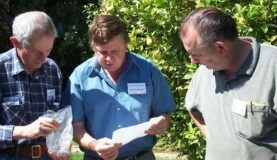 A remarkably similar tale was told by Peter Dalliston. When they were expecting their first child in the 70s Peter persuaded his wife that the purchase of a No 10 set would be a good investment (to develop the child's engineering inclinations?). After two daughters they had a son who at age 20 still has no interest in Meccano, so Dad has been forced to take over (tough luck, Peter!). Mike brought us up to date with the latest Committee deliberations. The meeting timetable for this year is in the December newsletter with the same arrangement as last year of alternating Saturdays and Sundays. 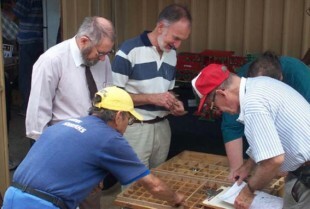 An annual exhibition will be held by the Club in 2003 over 2 days which will follow a similar format to last year's. the cover of the Exhibition Magazine. gold writing on a dark blue background. @ $6.00 each or $7.50 posted. if any alterations are required. Exhibition Magazine. All spare (originally 40) copies are now gone (sold to members at $6 each). Malcolm Booker eventually took 20 and obviously has been busy sending them to all his Meccano contacts, judging from the favourable emails that have been coming in from around the world. Thank you for doing this Malcolm, the positive exposure for the Club is very beneficial. Mike expressed congratulations and thanks to Bill Fitzgerald for the production and to Meerlu Pty Ltd for meeting the cost of printing. Bill Davis reported that Club membership stands at 67 (69 by the end of the meeting!) and that we continue to enjoy a healthy financial situation. Jack Parsisson provided the latest information about forthcoming exhibitions by the Club. Details of dates and venues are given on the back page of the newsletter. 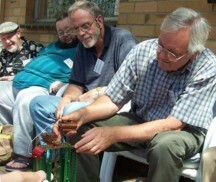 Bendigo Society of Model Engineers (5 & 6 July). This is only addition to the list in the December Newsletter. There will be a Social Dinner on the Saturday evening and Jack will need to know who is coming by 30 April so that the organisers can plan the catering for this event. Mike called for volunteers and 3 offers were forthcoming. If anyone else would be interested in joining the committee please give Kimball or Jack a call. Graham Jost brought the following items to the attention of members. 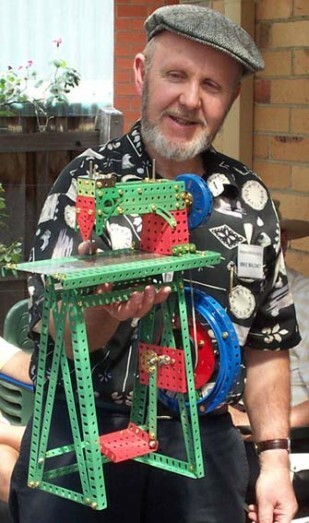 Paul Voaden, a British Meccanoman from the Atlantic Coast Meccano Enthusiasts' Club (ACME) will be visiting Melbourne on 14-16 March (same weekend as Scoresby). 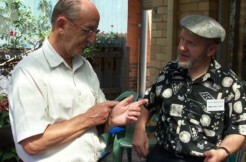 Any member who would like to show Paul around (take him to Scoresby maybe? ), please contact Graham. Paul's visit raises the more general question of looking after visiting meccanomen. 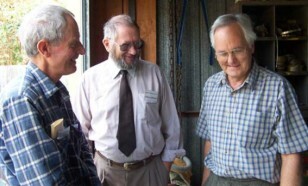 Such visits normally come to the attention of the Secretary (ie Graham) in the first instance who is usually happy to entertain them - show them his models and possibly take them to see Jack Parsisson and Tony Press. (Visitors are frequently left rather open-mouthed when confronted by the extensive and well laid out choice selection of rare and unusual Meccano etc. that Tony possesses. They do not expect to find such things in the colonies!) But Graham has no clear idea of who else would be happy to do this as well. So, if you might be interested in meeting a soul mate from other parts for an interesting few hours, please let Graham know and he can inform you when visitors are expected. Note that the idea is to provide general hospitality and there is no suggestion of offering accommodation (not that this would necessarily be unacceptable). Paul Dale's Box of Gears model that he showed at our exhibition is to be written up and published in the ISM magazine (all the more reason to join - see Graham Jost for details!). Our recent exhibition was featured in an excellent whole page illustrated article in the January 2003 edition of the ISM (International Society of Meccanoman) magazine. This was provided courtesy of Graham Jost and Kimball Monger. Exhibition Video There has been no further progress here - some editing of the footage is needed to avoid returns to the same themes. A voice-over would add a lot but would be a major exercise. Peter Dalliston brought up several items. Meccano Mags on CD. Those who follow the Internet discussion group on Spanner will be aware of a proposed project to put all MM's onto compact discs. This would be a major task and one suggestion is to find volunteers each of whom would scan 2 years worth of magazines. It is early days yet and there are major issues to be resolved - the sheer work of scanning and production of the discs (at least 10 CD's or 2 DVD's) and copyright matters to name just a few. But stay tuned - where there's a will there's a way! Meccano Axle Rod. The difficulty is that the size (No 8 gauge wire) is no longer produced although it can turn up from time to time in old stock. The nearest equivalent is 4 mm wire which is 0.0025" smaller in diameter - good enough for general work but could cause problems in demanding applications. Refurbishing Meccano Parts. For painting, spray pressure packs are the most commonly used and several members related their experiences with choice of colours etc. An excellent finish can be obtained with spray cans - Roger Hall has produced outstanding results. But Jack Parsisson (who uses a spray gun and enamel paint pigmented to order) warns that his paint supplier will no longer guarantee the colour of the paint. (Does this apply generally now?). An alternative is electroplating. Try D Trimble, 2 Hazel Ave, Dandenong, 3176 (Tel: 9791 6211) who does small (5 L or so) quantities in zinc, nickel or brass at moderate cost. 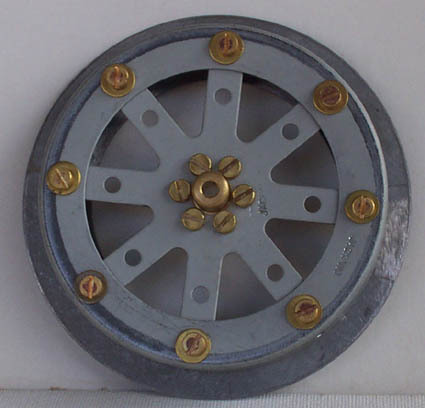 Jack Parsisson has a suggestion for Large Road Wheels for Models using lawnmower wheels which can be purchased from Super Cheap Auto Stores for $5.95 and are also available from Bunnings and Mitre 10. Push out the plastic hub and make up a Meccano version - Jack uses a flanged ring (part No 168a) on one side and a 4" circular plate on the other. See photograph. 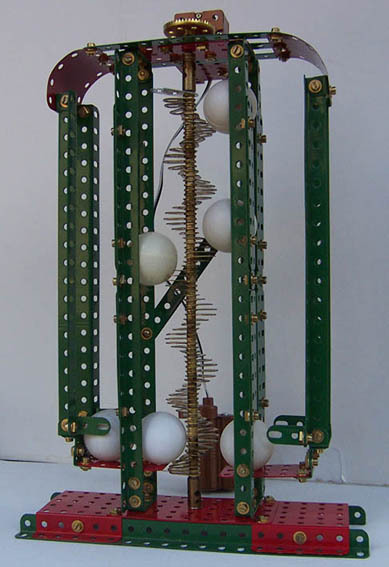 Graham Jost brought along two mechanisms, a spiral drive to be installed in a ball-roller model (not another!) and an intermittent motion mechanism. Peter During showed us two mechanisms for producing intermittent motion from the instruction book for the 1970's Mechanisms Set. One of them appeared to be assembled incorrectly and this generated much animated discussion as to what was wrong and how to fix it. One conclusion was that the construction details from this manual are notoriously unclear and it is little surprise that Peter had trouble. 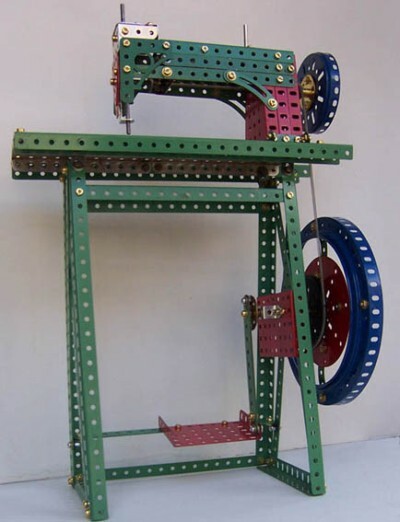 Mike Maloney had a very nice treadle sewing machine - only trouble was that it seemed to be constructed from M�rklin parts. But Mike assured us that it contained at least one Meccano part. Did anyone spot it? (look under Meccano Collector/Historian Series, Meccano Electric Motors) or Bert Love's article in Constructor Quarterly No 37 Sep 1997, p24. John Ince provided the following comments when I emailed him photos of Mike's motor. "This is indeed identical to my motor. In fact it is in much better nick than mine was when I bought it from a dealer for $30, probably about 1995, as the long side plates had been sawn off! .... I surmised that the side plates had been longer but seeing your example confirms that to be true. My motor works but runs like a drunken donkey! .... The odd thing is that the side switch motor does not seem to have been discussed in the Meccano Magazine although the Binns Road people did show a similar motor in the December 1925 Hammerhead Crane model. That motor has the side switch but has a drum commutator. My motor has been numbered DMS 2017aA in Don Blakeborough's Encyclopedia." No 7 Manual of the 1970s. It is a quite ingenious - the two oarsmen row the shell in a very realistic fashion as the model is pushed along the floor. 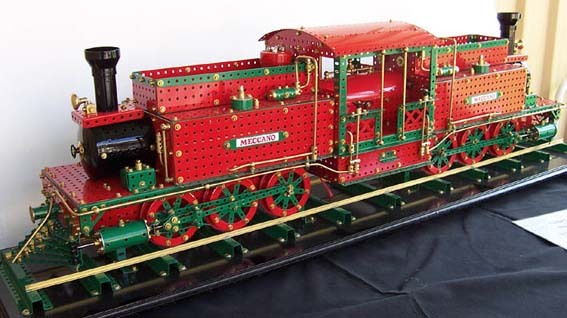 Jack Parsisson had yet another Mexican wood-burning locomotive on display - this time a Fairlie articulated locomotive. 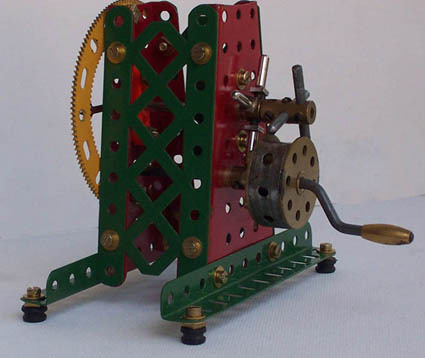 It was a typical JP model, motorised (of course) and nicely constructed using pristine Jackano parts in red/green. More Jackano! on Jack's Fairleigh locomotive. Purists look away now! It comprises a Jack Parsisson 31/2" circular girder with matching Narrow Strip Insert and Annulus.